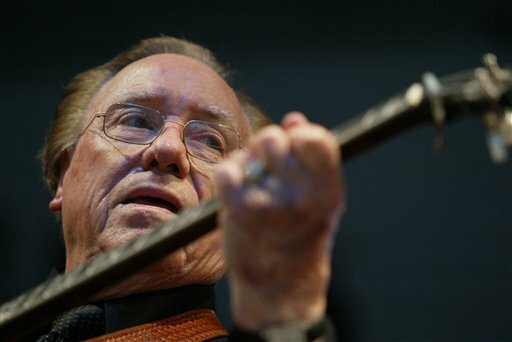 Earl Scruggs passed away on March 28, 2012 at the age of 88. Earl was born in North Carolina into a very musical family and he started playing banjo when he was four years old. His family were farmers and he grew up during the great depression, working on the farm and practicing his banjo. When he was ten, he developed his world famous 3 finger roll, known to this day as "Scruggs-Style Picking". He revolutionized the banjo and I think it's safe to say that Earl Scruggs is the most widely recognized banjo player anywhere in the world. Earl joined up with Bill Monroe and The Blue Grass Boys in 1945 and history was made as the sound of his banjo was broadcast over the radio on WSM from the stage of the Grand Ole Opry and into the homes of America on Dec. 8, 1945. From that moment on, Earl Scruggs established his signature sound and his rightful place of honor in American music history books forever. In 1948, Earl and fellow Blue Grass Boys band member, Lester Flatt struck out on their own and formed Foggy Mountain Boys and soon became known simply as Flatt & Scruggs. They played live on many radio stations and toured non stop in between appearances. Their first recording session was later that year for Mercury Records and then in 1950 they recorded their first session for Columbia Records. In January 1955, Flatt & Scruggs became members of the Grand Ole Opry and Earl moved his wife Louise to Nashville. Most Americans first became aware of Earl in 1962 when Flatt & Scruggs recorded "The Ballad Of Jed Clampett" which was the theme song for the CBS TV show, "The Beverly Hillbillies", the two making many appearances on that legendary program. This recording was also their only #1 hit and the first bluegrass song to go #1 on the country music charts. In 1967, Earl's trademark classic instrumental, "Foggy Mountain Breakdown" made it to the big screen in the film, Bonnie and Clyde, and also earned Earl a Grammy in 1969. In that same year, Earl Scruggs split from Lester and founded The Earl Scruggs Revue which included his 3 sons, Randy, Gary, and Steve, along with Jody Maphis and Vassar Clements. The Earl Scruggs Revue gave their debut performance back on the stage of the Grand Old Opry late in 1969 and in 1970 starred on a National Public Television program called, Earl Scruggs: His Family and Friends which included Doc Watson, The Byrds, Joan Baez and Bob Dylan. 1972 saw the release of the album, I Saw The Light With A Little Help From My Friends which featured Arlo Guthrie, Linda Ronstadt, Norman Blake, and The Nitty Gritty Dirt Band. This recording is a classic and mixes bluegrass, country, folk and blues, and members of the Dirt Band have credited this album as being one of the inspirations for their Will The Circle Be Unbroken series of recordings. 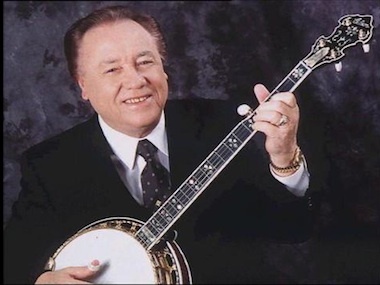 Earl Scruggs was featured on all three of the Circle albums. In 1985 Flatt & Scruggs were elected into the Country Music Hall of Fame and in 1989, Earl was awarded a National Heritage Fellowship. He was an inaugural inductee into the International Bluegrass Music Hall of Honor in 1991 and in 1992 he was awarded the National Medal of Arts. In 2001 he released Earl Scruggs and Friends, which featured guest appearances from: Johnny Cash, Vince Gill, Elton John, Sting, Steve Martin, Marty Stuart, Billy Bob Thornton, Leon Russell, Randy Scruggs, Jerry Douglass, Paul Shaffer, Albert Lee, Rosanne Cash, John Fogerty, Don Henley, Glen Duncan, Gary Scruggs, Travis Tritt, Melissa Etheridge and more. In 2002, "Foggy Mountain Breakdown" won Earl another Grammy from the version on this recording. In 2003 Earl Scruggs received a star on the Hollywood Walk of Fame and in February 2008, he was awarded the Lifetime Achievement Award at the 50th Annual Grammy Awards. I never had the honor of meeting Earl, but I'll never forget the first time I heard his banjo and I know it's the same for so many other musicians and music lovers around the world. His music is so special, it's one of a kind and the sound of his banjo will live forever as will his memory as one of the greatest musicians the world has ever known. Nashville is in mourning and I send prayers and condolences to the Scruggs family, loved ones and friends. Rest in peace, Earl Scruggs.